A Life of Leadership explored the extraordinary life of Grand Rapidian Ralph W. Hauenstein. COL Hauenstein was a leader in the West Michigan community, remembered for his role as a journalist, his military and intelligence service, his dedication to the Catholic faith, his entrepreneurship, and his philanthropy in Grand Rapids. Hauenstein left a lasting legacy in the United States and around the world. The exhibition highlighted Ralph’s extraordinary life, his contributions to our nation and community, and his legacy of leadership. Interactives allowed visitors to test out writing a headline for the newspaper on an antique typewriter and try their hand at cracking a secret code. Photography from around the world brought visitors face-to-face with Ralph’s impact globally. This exhibition was made possible through the generous support of: The Hauenstein Family and The Hauenstein Center for Presidential Studies at Grand Valley State University. Images and objects on loan courtesy of Brian Hauenstein unless otherwise stated. The images in this exhibition were first digitized for public display by the Hauenstein Center for Presidential Studies at Grand Valley State University. Thank you also to the National Cryptologic Museum, NSA, Washington D.C.
Born in Fort Wayne, Indiana in 1912, Ralph’s family moved to Grand Rapids when he was 12 years old and he graduated from Central High School in 1931. He was a public servant from his early years starting as a boy scout. Ralph was curious, inquisitive, and an exceptional storyteller, which led him to his first job as a police reporter for the Grand Rapids Press and later as a city editor with the Grand Rapids Herald. Ralph joined the U.S. Army in 1935, serving first with the Civilian Conservation Corps. In 1941 he began working as an intelligence officer in Iceland and rose to the rank of colonel. 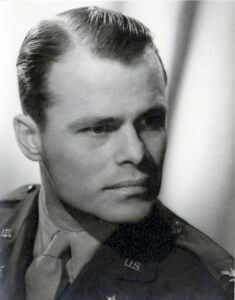 During World War II, he was promoted to Chief of Intelligence for the European Theater of Operations under General Dwight D. Eisenhower. An important part of his experience was the liberation of the German concentration camp at Dachau. His WWII experiences opened his eyes to the need for ethical, effective world leaders. Ralph saw first-hand that many countries face food shortages. After the war he returned to Grand Rapids and became an entrepreneur in international trade and food equipment manufacturing, designing equipment to make Goldfish Crackers. His success in business allowed for substantial philanthropic contributions in Grand Rapids. He gave generously to many local causes and established the Grace Hauenstein Library at Aquinas College, Mercy Health Hauenstein Neuroscience Center and the Hauenstein Center for Presidential Studies at Grand Valley State University.